Surely cats can’t get sunburnt with all that fur? Oh yes they can!! 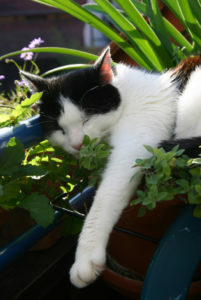 Our feline companions are prone to sunburn, particularly if they have light fur (especially white fur). In fact, the tips of a white cat’s ears are so prone to sunburn, it is advisable to keep them inside during the hottest part of those warm summer days and use a high factor sunscreen on their ear tips at all other times. Just like humans, cats are vulnerable to being stung by wasps and bees. If your cat has been stung, the area will be painful for them. If your cat is co-operative and you can see the venom sack on their skin, you may want to try and scrape it away using a flat card, such as a credit card. Whatever, you do, do not squeeze or burst the venom sack, as this may release more painful toxins into their skin. Don’t try this if your cat is distressed by the sting, as they may try to bite or scratch and you could get injured. If you are concerned, you should always speak to your vet, as they may be able to prescribe anti-inflammatories or pain relief to help alleviate your pet’s suffering. Remember, although very rare, some cats can have severe reactions following a sting, just like some humans do, so always monitor your cat closely if it has been stung and take them to a vet if you have any concerns. It is also always worth speaking to your vet if your cat has been stung around the mouth or nose, in case any swelling as a result of the sting causes your cat to have breathing difficulties. Fleas have become a problem all year round, particularly with the efficient central heating devices that we now take for granted. However, warm summer days can be particularly good at encouraging a rapid breeding cycle in fleas, so now is the time to check with your vet to ensure you have top flea protection in place for your cat and all your other pets as well. Speak to your vet on the best flea-prevention products to use – there are many to choose from including monthly tablets, spot-on pipettes and sprays. Don’t forget to treat the environment your cat lives in as well! Most importantly, remember never to use a flea product intended for dogs on your cat, as many of these can have life-threatening side effects in cats. Just as with fleas, ticks are often more of a problem in the summer months, where the warm weather encourages their life-cycles. Ticks can spread diseases and in severe cases ticks (and fleas) can cause anaemia in your cat. Speak to your vet to ensure you have your cat’s tick prevention under control; many products are designed to manage both fleas and ticks on your feline.